← Pyometras, Prostatitis, & Perineal Hernia, Oh My! Gift ideas for your pet this year! We all want to get our pets something special for Christmas. You know, shove a big bone in their stocking for them to “open” on Christmas morning. However bones aren’t always safe to give as a present. Bones can lead to GI upset or obstruction. And if your pet has food allergies, that will disrupt their allergies. Or maybe you’re just looking for new and fresh ideas to get your pet. Well, I’m here to help! Let’s kick this off with dogs. Heated Blanket or Bed. This is a nice gift option for the small breed dogs that are sensitive to the cold. Your outdoor furry friends may appreciate this too! Personally, my dog who is 40 pounds of muscle, enjoys being warm all winter long. However, her dog attire is not enough for her to feel comfortable for bed time. So a heated blanket is the next best option for my sensitive girl. Another use; dogs with arthritis may appreciate the warm comfort of this gift on their achey, tired joints. TSC or Rural King often times have great pricing on heated blankets/beds for dogs. The other option is buying a heated blanket for humans and folding it to your pet’s bed size. This isn’t for every dog, I get that. Maybe your dog is a simple kind of guy, in which a bow tie or a bandana would suffice. Maybe you have a princess on your hands, and only this finest dresses will do. Or maybe you just have a spoiled mutt, like I do, who wants to be wearing plush pajamas all season long. There’s something out there for every dog! TJ Max & Pet Smart are great places to find clothing for your dog’s liking! Homemade Presents mean the most sometimes. There are tons and tons of articles on how to make treats for your dog at home. A big cheese flavored bone treat with a red bow on top says “Merry Christmas & I love you” a thousand times over! If you’re looking for a safe recipe, you could always call into the clinic and we could provide you with options! Pet Tag Cover. I loathe the sound of my pet’s jingling pet tags at they wonder around the house, come barreling inside, or are up running around in the middle of the night. To solve this problem, I knit a cover to tie over their tags. I can’t imagine how much a relief it must have been for my pets not to hear that every time they moved, but it also quelled my annoyance with the sound as well. So really this is a double gift. You can DIY this or find them on Etsy for a reasonable price. Pet Massage or Reiki Session. I am a firm believer in the “Treat Yo’self” method. I’d like to imagine your pet would be too. This may be on the more expensive side, but let’s be honest, Fluffy is so worth it. 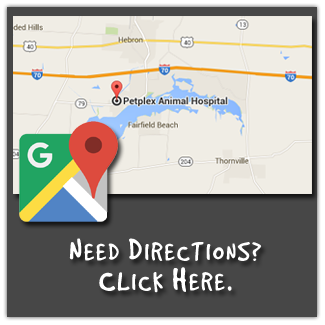 You’re welcome to call in the clinic for the best places for pet massage and reiki sessions. As a matter of fact, one of our technician’s can do reiki right in the clinic! Okay, cats are the harder sell, but I will do my best. Pet Water Fountain. Cat’s don’t do a great job of staying hydrated. Pet water fountains are an inexpensive way to encourage hydration. These fountains generally trickle water down a board and filter it back through. So filtered, clean water is available at all times. And we all know that cats love drinking from running water. You can find one for $20 at your local pet store. Cat’s Meow- Spinning Cat Toy. My cat got this for his first Christmas and it will forever be his favorite toy. He even knows how to turn it on, all by himself. This is an “As seen on TV” product and it is so worth it. Cat Tree! Some cats are “bottom dwellers” and others prefer elevated spaces. First, check your pet’s preference. Are they usually on something? (Bed, counter, etc.) or under something? (Bed, table, etc.) If your pet likes to climb, go for something with higher options. If your pet prefers to be under something, go for one closer to the ground, These products are nice because it gives your cats a space of their own to destroy as they wish. Which, we all can agree, is a cat’s favorite past time. It is essential that your cats have a space to scratch and stretch up on. Cat’s enjoy sharpening their talons. A cat tress gives them an outlet for that. A Litter Box. You may be thinking “Booooorrrrinnngggg” but this is something that is very important to cats. Did you know that cats like a variety of places to use the bathroom? The rule of thumb is one litter box per cat, plus one. For example, I own two cats, so I have three litter boxes. The next thing to know is the litter boxes should be spread out throughout the home. Litter boxes that are in close proximity are considered one litter box to a cat. Lastly, I do recommend having varying types of litter boxes. I have at least 1 open top litter box in the home. This way I can ensure my cats are satisfied in their litter box selection. Environmental needs are essential to your cat. And if you are a rockin’ cat mom/dad and already do the aforementioned, then treat yo’self to a Litter Genie or a self sifting litter box. You deserve it. If….you have a lazy & unconcerned cat, maybe a special can of food for Christmas breakfast will be enough to celebrate with your kitty. Consider a new hide for your reptilian, or rodents pets. Variety is the spice of life after all. Horses. Some horses enjoy enrichment toys. TSC and Rural King have plastic balls that treats or grain go inside. This is nice for them to knock around the stalls when they’re cooped up in a stall during the winter. I know there are chicken people out there, and I have not forgotten you. I highly recommend purchasing a solar powered chicken coop door. It will open and close as the sun rises and sets. This way your birds can be out as soon as the sun comes up and be tucked in safe when the sun goes down! I hope you guys enjoyed reading through this article and got some great Christmas ideas. I hope each and every pet gets a warm, safe home and a great gift from their parents for Christmas. If you can this season, consider adopting a homeless pet, or even just donating to a local rescue or shelter. Some places offer their pets up for a sponsorship and even Christmas vacation programs. Thank you guys for reading and I’ll catch you next time!